Shortly after the trip to Pane Bianco, my coworkers started to arrive at Phoenix, so pretty soon we were all packed up with our gear and heading out to Gold Canyon, AZ. Except Gold Canyon isn’t exactly known for having a lot of restaurants, so we decided to grab dinner on the way out of town. Wanting to give them a taste of something that my VT and NH coworkers weren’t likely to experience back at home, I decided to take them out for New Mexican cuisine. And for that, I took them to the nearby branch of Los Dos Molinos in Mesa. Los Dos Molinos is a small Phoenix-based chain of New Mexican restaurants, with about a half dozen locations spread throughout the metro area. 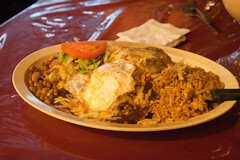 The focus at Los Dos Molinos is on New Mexican cuisine, with a particular emphasis on using Hatch chiles, and on New Mexican specialties like carne adovada (marinated pork). And they definite like to apply the chiles liberally, with the result that Los Dos Molinos is a particularly good antidote to the moderately bland Mexican food that I usually get up in New England. 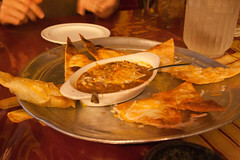 Looking over the menu, we decided to start with a cheese crisp, served up with a tasty chorizo bean dip. I’ve always been a bit skeptical of cheese crisps (maybe it’s from eating too many “Mexican Pizzas” in the school cafeteria as a kid), but here it work. The bean dip was a pleasantly rich pinto bean dip with some nice spicy chunks of chorizo in it. Served up with a healthy dose of both red and green salsa (both firey), it was a good start to the meal. For the main course, I went for the enchiladas. For me, an enchilada is all about the sauce, so it’s a great way to showcase a good mole or chile sauce, and Los Dos Molinos serves up a seriously good Hatch chile enchilada sauce. They also did a great job with the rest of the dish: the tortillas for the enchiladas are hand-made. The chicken in the enchiladas was nicely tender and flaky. The beans were just the way I loved them, cooked so that they are just barely starting to fall apart. And the rice was a flavorful medley, and not the tired old “Spanish rice” I usually get at nominally Mexican places. Los Dos Molinos is not a fancy joint, but they’ve got some quality food, with a good amount of flavor and heat, served up by a pleasant staff. I’ve been here many times before, and wouldn’t hesitate to come back. It was an especially good place to introduce my coworkers to New Mexican cuisine. On Memorial Day, we decided to drive up to Burlington, Vermont, and go bike riding on the Island Line bike trail. Afterward, we then headed into downtown Burlington for some dinner, ending up at American Flatbread after stops at Three Needs for some beer and Hong’s Chinese Dumplings for a quick snack. We’ve long been fans of American Flatbread. Being first introduced to them via their frozen pizzas (which have outstanding quality, unlike most frozen pizza), we then visited their main bakery in Waitsfield, VT back in 2001. That place is an experience; they’ve taken an old barn, and 4-5 days a week they produce the frozen pizzas there, and for the weekends they put away the assembly line, rolls out tables with red-checked tableclothes, and run a very informal restaurant and bar. It’s quite the experience, and one I recommend (I’d write it up here, but I still don’t have photos from there), since it is about as “Vermont” as things get around here. In 2005, American Flatbread opened up a location in downtown Burlington, which brings a good part of the Flatbread experience to town.